Yellowtail flounder stocks and movement patterns throughout the waters of the Gulf of Maine and southern New England are poorly understood. Due to the uncertainty regarding these stocks, a cooperative yellowtail flounder tagging study was initiated in fall of 2003 by NOAA Fisheries' Northeast Fisheries Science Center (NEFSC). Fishermen throughout New England are working with NEFSC to tag and release yellowtail from the Gulf of Maine through Georges Bank and southern New England in an ongoing collaboration	to better understand yellowtail movement, mortality, and aging. 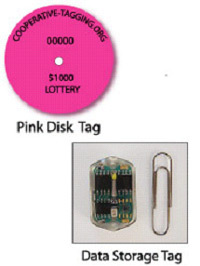 Flounder are tagged with either a pink disk tag or an archival data storage tag that records temperature and depth. Tagging by SMAST researchers	is just one part of a larger multi-agency cooperative tagging program targeting yellowtail flounder. Yellowtail flounder are tagged throughout southern New England by the Massachusetts Division	of Marine Fisheries (MDMF) and School for Marine Science and Technology (SMAST), under the guidance of the National Marine Fisheries	Service (NMFS) Cooperative Research Partners Initiative(CRPI). Information about the overall project can be found at http://www.cooperative-tagging.org/. To learn more about the SMAST tagging effort, click on the items in the menu below and at left.